All other confectionaries & products are priced individually. Please add 10.95 for orders under $100. Orders over $100 - shipping is FREE! Please note that availability and pricing on all items are subject to change or discontinuation at any time without prior notice. In the event a product is listed incorrectly due to typographical or other error, Drummond Island Fudge shall reserve the right to refuse or cancel any such orders. Please note that colors depicted in photos may vary. ALLERGY INFORMATION: Manufactured on same equipment that processes flour, egg, peanuts & tree nuts. Contains soy, cream, milk. May contain peanuts & tree nuts. An assortment of 10 mouth watering flavors, blue raspberry, caramel apple, chocolate, cinnamon, licorice, neapolitan, orange vanilla, peppermint, rum, and of course strawberry banana. 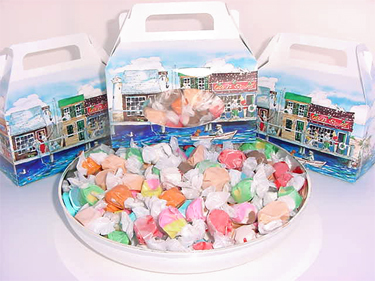 Each variety is flavored just enough to give you a real taste sensation .Our secret to making delicious taffy for you is to pull each recipe just the right amount of time and use only finest ingredients we can. Priced per pound. Copyright © 2007 - Drummond Island Fudge. Unless otherwise noted, all descriptions, images, and programs are the property of Drummond Island Fudge, and may not be copied for personal or commercial purposes.